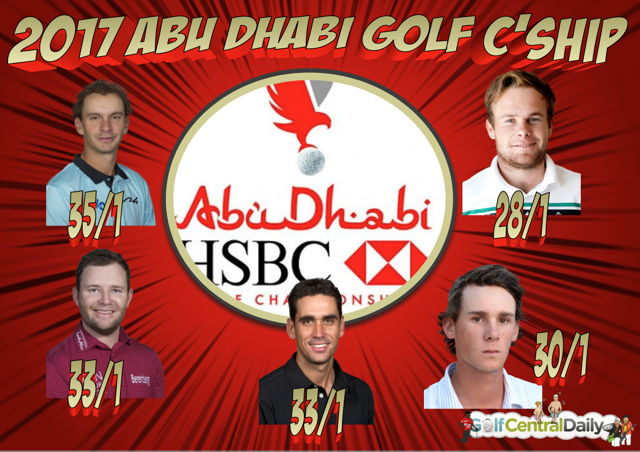 2017 Abu Dhabi Championship Betting tips. The European Tour has attracted some stellar names to Abu Dhabi this week with Dustin Johnson and Rickie Fowler set to tee it up against home favourites like McIlroy (if he makes it through a back problem), Stenson, Willett and Noren. If Rory does play he will start favourite at 9/2 having come second four times and third twice at Abu Dhabi golf club. Dustin Johnson is around the 8/1 mark and makes his debut on the course. Joost has the game to contend early in the season and after winning his home KLM Open last year looks a strong prospect to push on this season. Pounded the greens on his way to a T5 finish last year. He's finished in the top-6 in his last three visits. Very interested to see how Tyrrell Hatton does this season. Looked a world beater towards the end of 2016 with a win at the Alfred Dunhill Links and finished in the top 25 in every event since including a solo second at the Tour Championship. Didn’t happen for him on the course here last year but was T6 in 2015 and T10 in 2014. First outing for Thomas Pieters this season and he has the game to contend on the course. Went -4, -6, -5 on the par 3's, 4's and 5's last season on his way to solo second behind Rickie Fowler and was T4 in 2015 going -9 on the par 4's. Big each way chances. Branden let us down badly in the tips lately but going to give him one last chance to make it up to us. After an awful performance at the TOC, the South African improved to T13 at the Sony Open last week. A Middle East winner in Qatar in 2016 and has two top five finishes here since 2013. It's coming up on five years now since Rafa last won on Tour and surely he has to get another W soon. Solo second in Hong Kong at the tail end of 2016 and he also started with seconds in Qatar and Dubai. Best of a mixed bag on this course was T4 in 2014. There's just no predicting what Thorbjorn Olesen is going to do on any given week but might be worth following from 70/1 here. Won brilliantly in Turkey last year and was T2 in Abu Dhai in 2013 and T8 in 2012. I'll also be charting the progress of Peter Hanson from 80/1. Peter is a wily old campaigner who showed the British Masters (T4) last year that he can still compete. He was solo second here 10 years ago when Paul Casey won!